When they say 'follow the money,' this site is how you do it in the information age. Who's giving and who's getting, searchable by politician, industry, state, locality, PAC, and individual donor. Breakdowns of the national and state races by dollars. Use this link to contact and watch the office that is charged with building and maintaining a viable American Merchant Marine, the Maritime Administration (MARAD). Official site of the National Labor relations Board. Includes press releases, public notices, fact sheet, summaries of labor laws, manuals and forms. The MCTF is a coalition of companies and unions joined together to support domestic shipping under the U.S. flag and to preserve cabotage laws, also known as the Jones Act. TTD represents the interests of several million aviation, rail, transit, trucking, highway and longshore workers before Congress, the Executive Branch and independent government agencies. Through TTD, the working men and women who are represented by the Department’s 32 member unions have a strong, united voice in Washington, D.C.
States relies on its maritime industry for both military and economic security. For more than 200 years, the US-flagged merchant marine has contributed substantially to U.S. economic vitality and independence, and helped to underpin America’s position as a global power and the world’s biggest aid donor. "Carry this Strike Card on your person with your Union Card and show when demanded, and while you have it on you go to no place where you would not show it with pride, and do nothing to put on the Stain of Dishonor. When the strike is over the Secretary will endorse upon this card the fact (if true) that you have assisted in saving the Union. And then when sailors are free enough to (word illegible) to marry and have children this will be your certificate of honor to them. This strike was ordered to SAVE THE UNION, to enforce your rights as free men, as Americans, as haters of slavery. Never give it up until ordered by the Union. Never yield a single inch. Remember that BUCHANAN of Colorado called you the 'Lookout of the American Labor Movement,' the backbone of organized Labor on the Pacific Coast. Remember your glorious history and die in the streets of San Francisco of starvation before you think of yielding. And remember that if we have to beg the public of San Francisco for food, then I will be the first man to go from house to house for dry bread to keep life in our bodies while we are fighting for the right of the sailor to resist the bloodmonied infamies of San Francisco. " -Burnette G. Haskell Chairman, Advisory Committee; Instructions on the back of an 1886 strike card. "Since I became Chairman of the Joint Chiefs of Staff, I have come to appreciate first-hand why our merchant marine has long been called the nation's fourth arm of defense.... 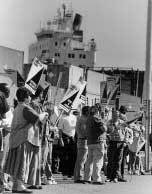 The American seafarer provides an essential service to the well-being of the nation, as was demonstrated so clearly during operations Desert Shield and Desert Storm."